Michael R. Twiss, Ph.D., is a professor of biology at Clarkson University, teaching classes in Limnology, Microbiology, Environmental Science of the Adirondacks, and a new course entitled ‘Great Lakes Water Protection.’ He is a member of the Frontiers in Aquatic Microbiology editorial board and has served on grant review panels for the U.S. National Science Foundation (NSF), Natural Sciences and Engineering Research Council (NSERC), and other agencies. 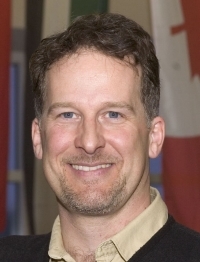 Twiss came to Clarkson University in 2002, following a brief tenure at Ryerson University in Toronto and a post-doctoral fellowship in the Department of Marine Chemistry and Geochemistry at Woods Hole Oceanographic Institution. Twiss is a limnologist (fresh water scientist) with expertise in the microbial plankton ecology of the Great Lakes-St. Lawrence River system and interactions of plankton with trace elements in the water column. His research aims to understand the impact that microbes have on the geochemical fate of nutrients and metals in natural waters and how plankton respond to changes in their natural environment. Research is conducted in the field on research vessels and in the laboratory using organisms isolated from nature. Current research centers on determining changes in plankton during transit down the St. Lawrence River, the biogeochemistry of Lake Erie in winter, and trace metal regulation of nitrification in the Great Lakes. His research has been awarded the Governor General of Canada Gold Medal for Academic Excellence, the Premier's Research Excellence Award by the Province of Ontario and the Chandler-Misener Award by the International Association for Great Lakes Research, and has been funded in the past five years by such organizations as New York Sea Grant, the New York Power Authority, the NSF, the USEPA Great Lakes National Program Office and the Syracuse Center of Excellence in Environmental and Energy Systems. Twiss has over 50 peer-reviewed publications.